@leatash Very true. If the sea wall wasn't strengthened, it would be washed away followed shortly by Marine Parade. 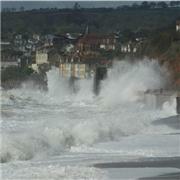 Do we want to protect the railway and Dawlish or not, sea levels are rising storms are getting worse i for one welcome it. Will it affect tourism i wouldn't think so for one moment but if the line was closed for months that might. I wonder if there is a case for the residents to sue the council for loss of income if the wall's impact does affect tourism? I am sure many would chip in to take on Teignbridge if it does turn out to be an ugly disaster. Just a thought. Teignbridge Planning Committee approved the application this morning. The Lib Dems led by Martin Wrigley tried to defer it but lost 6-10. What's really strange, that when approval 'as set out' was moved after deferral was lost, the whole committee voted unanimously in favour (16-0) which included all the lib dems ? !